My girlfriend noticed this truck this morning. She figured I would probably get the reference better than her. She was right and this sticker is perfect and the owner is my new hero. Yeah, I know. Nobody here really cares about the cruze. But hear me out. Hondata just released a video where they dyno-tested a 2016 Civic EX Turbo and then had it race a 9th-gen Si on an 1/8th-mile race. The results are pretty telling. Ever wondered how big of a difference 100 hp as well as meager 1.5 seconds difference looks like on a drag strip? Me and my buddy decided to give it a go. For the hell of it. Everyone probably knows at this point that the Scion iA sedan is a Mazda2. A slightly surprising decision but not a risky one because scion is not a high volume brand nor is it one who’s image has much of an impact on Toyota’s in the eyes of the general public. Was bored so I made this. Im sure many can relate. So, although I’ve drag raced many times, I’ve never driven on a road course. I had also never dreamed about passing an Aventador at a track either. Decals and looking like fools. So today I saw a 2013-2014 Kona Blue Mustang with a white Mustang Boss style stripe going from the top of the front fender down and along the bottom of the side of the car. 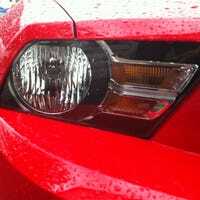 At the tip of the stripe on the fender was written “Mustang Chaos”. A demonstration of how slow malaise era cars were. My dad had an 82 camaro z28. 305ci, 165hp, 8.6 to 60mph and the 1/4 in 16.4. And it gets walked soundly by a 2014 mazda3 with the lowly 2.0 skyactiv with a measely 155hp. 0-60? 7.7. 1/4 in 15.9. 40mpg highway! A few months back, I said I would eventually release a driver cam video of my “ugly face” driving my mustang. Because driver cams are apparently really cool. So, I finally delivered. Another example of Mustang Cheapness. I present to you, the factory shifter housing bracket that bolts said housing to the chassis. Yes, those are FACTORY zip ties. By being cheap as hell. RoosterTail: What am I packing for my week long PWC trip? Mustang back on the road! Driver Cam Incoming. So, my Mustang is officially back on the road! I’m pretty excited! I’ll be getting some tires and a couple of parts installed next week. You know what else will be coming? Driver cam videos. RoosterTail: Ottawa Area PWC Owners, Let me review your ride! In order to help new and experienced Personal Watercraft enthusiasts make better purchasing decisions, as well as provide them with an entertaining read, I would like to start dishing out some more reviews.